It’s hurting your Google rankings right now! 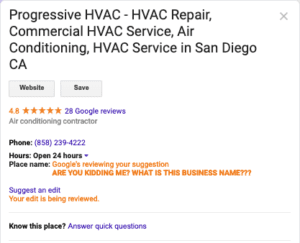 We are spending about 2 hours of each work day, searching for Business Name Spam offenders and either directly editing these listings or reporting them to Google. It’s ugly and it’s a problem that’s currently completely ignored by Google. Ugh. 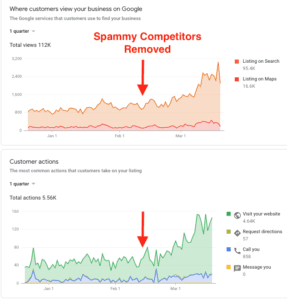 Update: The day after this post was published, Jamie Pitman posted “The Rise (and further rise) of Google My Business Spam” on Search Engine Land. It’s an awesome deep-dive if you want to learn more. 1) The ranking weight of the business name is too great. Yes, the name of the business should impact Google rankings, but it’s just WAY too strong a ranking factor right now. We’ve seen a business leapfrog dozens of competitors just by adding one word to the business name. 2) There is no enforcement of abuse of the business name field guidelines. Humans are like piranha’s in this type of situation so the problem is expanding rapidly like a bad cancer. 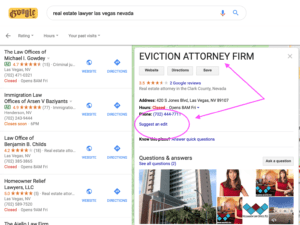 3) The general public can “suggest edits” to listings, and these edits are moderated by humans, but the business can just re-edit the name – without penalty. In my opinion, due to inaction on the part of Google, we each have to take matters into our own hands and look out for our own best interests. I wrote a blog post about this 2 years ago and this problem has only gotten worse. We’re on our own now. Let’s do something! How does that sound? #1 Monitor your competitors on Google Maps: Are spammy business names dominating the local pack for your top searches? Conduct searches for your top keyword phrases + location weekly to see if there are any major offenders. #2 Actively “Suggest Edits” to offending listings. Click on the listing and you’ll see “Suggest an Edit:”. Let’s practice with this incredible violator called “EVICTION ATTORNEY FIRM”. We know this is fake immediately since it’s in ALL CAPS. No one would name their actual business with this BS. 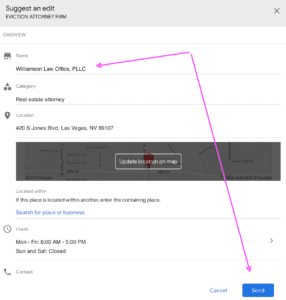 Oh lookie – the actual business name is “Williamson Law Office, PLLC” Nice one, guys. They probably rank #1 for that keyphrase in Las Vegas. It’s that easy. When editing, you have an option to upload a photo for “proof” to help the moderator to determine if the edit should be published. I ALWAYS do this. 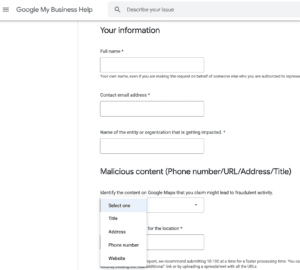 This form is new, as of March 2019 and lately the Customer Support team who handles support on Twitter for @Googlemybusiness has begun directing me to this form. They’ve just this week added functionality to upload spreadsheets for offenders with multiple locations. We’ve been battling this issue daily for months for many clients. One of our service area business clients had a competitor with DOZENS OF FAKE LISTINGS – one for each city in their service area. 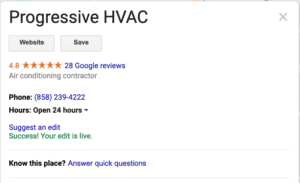 Each with unique phone numbers and post card verified listings. This business had faked their way into becoming the leader in the region in their industry and was out-ranking all of the legitimate businesses. We were able to successfully NUKE THEM OFF GOOGLE – Completely. Their listings were not just edited – they were removed. It was a lot of hard work but totally worth it to our client who is now struggling to keep up with demand from all their new customers. For this type of work, it’s helpful to have experience and know how to communicate with Google support. It’s also helpful to be a high-level Google Guide with a trusted profile. And as always, if you are experiencing problems with this issue, we can help. This is one of the behind-the-scenes things we do to keep our clients humming. We can’t guarantee 4x spikes in results and we know that any given day Google will make an update and change this entire scenario completely. Hopefully, they get it right – and soon!